Sk.In project is focused on creating, like the name aims to manifest, skills for inclusion. Which skills? The skills were chosen accordingly to the specifics of the target-groups involved in this project. Each partner had to be assessed and understood in order for the team to fully grasp their needs and then was designed a training experience where useful, practical and transformative skills could be shared. In this project we could develop team building activities, communication awareness and conflict management skills, learning to learn methodologies, cooperation and empathy among others methods where shared and practiced in order to assure that all participants would be able to present and perform the necessary steps in order to facilitate this methodologies in their youth work environment. Inclusion of whom? Risk-groups making part of the network of partner associations in Italy, Greece and Romania. Fewer opportunities youngsters in the case of Italy and Greece, and inmates being held in Satu Mare state penitentiary. ➔ The fact that the team of trainers and participants was composed of skillful and engaged people allowed the learning experience to happen in a proficuous manner where inclusive expertise, skills and competences from different organizations could be shared. ➔ Having a state penitentiary as a partner organization provoked many positive aspects to generated. The learning process necessary to have the activities implemented in such place, made us learn how to reach this population with tools that can also be used with youngsters and other groups. We could also understand how this work affected for each training, more and more, beneficiaries and how the practices were having a positive impact in the inmate community. This working environment motivated us to develop more work with such type of organizations, being now planned an intervention project based on Sk.In just to work with the penitentiary environment. ➔ The flexibility and cooperation between partners allowed a flow of activities that suited the needs of all and match the expectations prior to the different stages of the project. We also attempt to have a balanced share of workload between partners in order to have a positive and constructive process of project development. 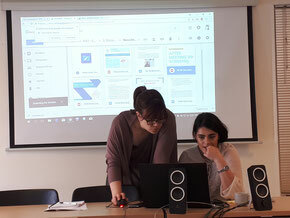 ➔ The commitment and perception that the learned tools would be useful motivated all partners to implement them not only in follow-up activities connected with Sk.In but also on other activities that proven themselves more effective with Sk.In based learned tools and methodologies. ➔ Using a tool like Badges for assessment of competences allowed to have a visual understanding of the learning process and recognition. Having in consideration all the above achieved objectives we consider that a series of opportunities arose from them, mainly the interest of creating new projects to be implemented in the future, in which all organizations could reinforce the bond created during Sk.In and also improve and redefine the achieved tools and methodologies that provoked a positive impact. In this way we consider that we strengthen the international cooperation by working with different partners with different knowledges implementing groups based learning experiences. Working with a penitentiary was also an amazing opportunity to learn new challenges by having to create or adapt training content to a specific environment so rich of challenges connected to minorities and how this raised awareness of this very specific target group. Some other challenges proven themselves as ‘things to improve’ as we believe now that the impact would have been greater if we had more time to know the participants at local level during the local activities to better integrate the knowledge and learnings. Eventually having more local activities or longer in duration. This intervention period is where the learning process happens, so the greater the time to work with the participants, the more likely will be that the competences are absorbed and understood. Also the time consumption generated by the development of the website and the different newsletters are difficult to value as the effort was very demanding and the results hard to measure. Finally the usage of Badges as a working tool proved itself more challenging than previously expected since we felt big resistance of participating groups on local activities to use them as well being an unknown technology that few were aware about. Particularly in the penitentiary since there’s a limited access to internet and also because inmates tend to leave inside the walls, the things happening inside walls. Still we believe that we can also improve our presentation for Badges in order to make them more appealing and motivational even considering the possibility of having the Badge partners included mainly as a technical partner. In all, Sk.In was an amazing experience for all that were involved in the different stages of the project and it is agreed among partners the great cooperation that motivated the objective accomplishment. ● How the number of affected people grows accordingly to the number of learning experiences taken place. ● Restrictions of time and characteristics of the trainings actions sometime were not the best to implement all the activities. ● The possible lack of practice on the learnings achieved that can lead to the loss of the ‘knowledge’.